Whether you view spending Christmas single as a gift or almost unbearable, don’t let it turn ugly! The Independent UK newspaper sets the stage of how a single Christmas can turn very, very ugly but luckily gives us tips to prevent this! So please, read on! 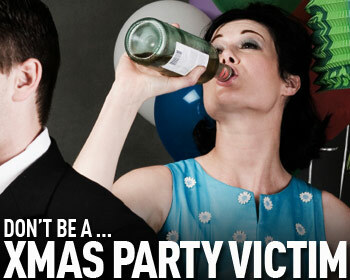 “To single men, the Christmas party season seems too good to be true. Where else can you meet so many inebriated women in such quick succession? Like a good wedding reception – which all singles know is the best place ever to pull – everyone at a Christmas party is in the party spirit and, even better, smashed. The party season is like speed dating – but with tinsel and mistletoe. The truly dedicated can, by the last days of December, have swapped so many telephone numbers that the long, lonely days of sober January and deep dark February will be enlivened by at least a handful of dates to keep the twin forces of SAD (seasonally affective disorder) and MAD (money all done) at bay until at least Easter. “Let’s start with the most obvious problem: everyone, including you, is drunk. A small amount of alcohol is the best social lubricant there is, but, as we all know from experience, a large amount of alcohol can lead to public disaster. This is not the opportunity to try to impress your boss: do not tell your boss anything, in fact, do not even attempt to speak to your boss. Sorry to sound like your mum but the safest route is not to drink too much. Now, everyone has a different idea of what is too much but, as a rule of thumb, when people you would never normally fancy start to become extremely attractive, then you have drunk too much. Two, do not seduce people who are more drunk than you are. It may be easy but it is unseemly and goes against the basic rules of the game but you may also end up covered in sick in the back of a taxi cab, or embarrassed at work the next day or, worst of all, someone will wake up next to you with that undeniable “I can’t believe I went to bed with him” look on their face. And, while you’re bound to bump into everyone you’ve ever snogged over the Christmas party season, beware, this is no place to pick up your ex-lover. Third, be very, very careful about who you find attractive. I speak from bitter experience. My Achilles’ heel is to find attractive (nay, mesmerising) the loudest, most outrageous, and most entertaining woman in any festive gathering. Through the blur of festive inebriation I have, too many times to mention, found myself deeply attracted to someone who is – if I was sober – clearly an unstable lunatic. She who seems the life and soul of the party at 2am will, inevitably, turn out to be a complete maniac when you meet her for lunch a week later. In a roasted chestnut shell, the worst of Christmas danger is that, at any other time of year, your singleton’s humiliations remain your own. You will choose which friends get to hear of your latest disasters on the rocky path twixt bed and bar. But, at Christmas, the season of goodwill is really “the season of good stories about what happened the night before” – so be warned because, at Christmas, the whole world is watching. Remember, if she wasn’t attractive all year, but you find yourself saying, “I’ve suddenly seen her in whole new light,” that’s the free bar speaking. Stop, when you think your dancing is amazing. According to women, before going out, you should discard the first thing in the mirror that grabs your eye. It’s the same with women. Think outside your league. If she was attractive all year but you felt you were out of your league until now, that’s the free bar again. And there you have it. Everything you need to be prepared this Christmas season.